So you’re all hitched up and ready to head for the horizon with your caravan – but is there anything you should be checking before you set off on your journey? Is your caravan and car really safe to venture on to the open road? After taking my trailer tow test back in August last year it really opened my eyes to the safety side of things. There really is a large number of things that you should (most people don’t) check before you set out on your journey. 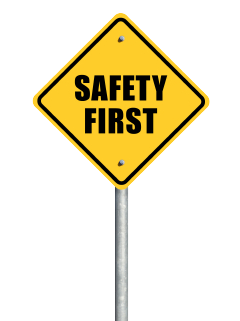 In this post I am going to list those things in an attempt to make your future caravanning adventures safer for you and other road users. Feel free to print this article and user it as a kind of check list for each journey! Please note: This list in no particular order and is by no means a complete list. Please use the comments section at the bottom of the page to add your own tips if you feel I have missed something important from the list. 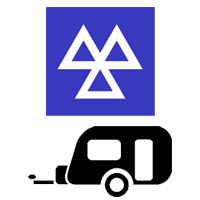 This one may seem obvious but I have seen it many times – Is your caravan PROPERLY hitched up to your car? By properly I mean that it will not jump off your towball a mile down the road. Depending on whether you have a stabiliser on your hitch head will determine the check that you should perform to ensure you are properly hitched up. If you have an AL-KO stabiliser there is a green indicator on the head of he device that tells you that you are hitch up correctly (see diagram below, green arrow points to green indicator). To test if you are correctly hitched up when your caravan does not have a stabiliser, simply wind the jockey wheel down further, if you are correctly hitched it should raise the car. Do not attempt to do this if you have a stabiliser fitted as this can cause serious damage to your stabiliser pads. A breakaway cable is now required by law while towing. Check that your breakaway cable is correctly attached around your towball, this video by AL-KO demonstrates how to connect your breakaway cable. I would also recommend checking that your breakaway cable is not broken or frayed as a faulty breakaway cable could prove extremely dangerous. Check that the gaiter on your damper (the corrugated rubber around the section between your a-frame and hitch head) is not split. Any splits in the gaiter could allow grit and debris to get into the mechanism and prevent it from operating correctly. Without your damper in action an emergency stop can be very dangerous. Is your jockey wheel retracted and stowed away safely? Think of your jockey wheel as your landing gear – it is not required during the flight. Is the rubber insulation damaged exposing any wires? Is the socket damaged in any way or missing pins? Are they connected to the car correctly – pushed all the way in? It is always worth asking someone to assist you in checking your lights. It is highly recommended that you check your tyre pressures before every journey with your caravan, just as it with a car. Tyre pressure gauges are very cheap and so there is no excuse not to own one – if you do not own a tyre pressure gauge buy one here . Refer to your manual for the correct tyre pressures for your caravan. Another commonly overlooked safety check that should be carried out before every journey is your wheel nuts. A torque wrench is another cheap piece of equipment that can help to prevent loss of wheels whilst towing – if you do not own a torque wrench buy one here ! Check what torque setting your wheel nuts should be at in your caravan’s handbook. Blow outs are one of the main causes for accidents involving caravans on our roads, and the sad thing is that in most cases they could be avoided. A quick visual check of the condition of your tyre before each journey is all it takes. You want to ensure that there are no cracks or chunks out of the tyre wall as these can be signs of a weakness in the tyre. If in doubt have an expert take a look for you – better to be safe than sorry. If you own a twin axle caravan it is wise to check for any bricks, wood or debris that may lodge itself between the two wheels when you set off. Many caravan owners use bricks or blocks of wood to further secure their caravan in position in storage. A brick between the wheels on the road would be ugly. Are your corner steadies raised ALL THE WAY UP? None of this “half way will do” stuff. If you drive over a pothole with a corner steady half way down it could tear the bottom from your caravan and obstruct other road users. Wind them all the way! If you have a directional aerial ensure that it has been retracted. Has your inside load been secured? A set of big heavy awning poles rolling around inside the caravan is just not good for the towing physics. You don’t want anything to influence the direction the caravan travels in except your tow vehicle! Lastly, before you pull off check that your handbrake is off. You would believe the amount of axle and chassis damage that is seen every year by caravan engineers. Not only is it a VERY costly fix but it is very dangerous to be towing with your handbrake on. That concludes my list of 15 pre-flight checks every caravanner should undertake. I hope you enjoyed it and were able to take something away from it. Hopefully I didn’t tell you everything you already know, having said that it never hurts to be reminded when it comes to safety! Please join in the conversation in the comments below, introduce yourself if you’re new and share any of your own pre-flight check tips with the community. I have prepared you a document with all the above checks that you can print out. To do so, click on the link below and hit the printer icon. I have just bought a 1991 Avondale Leda Pennine single axle 5 berth. The tyre pressure can sometimes be found printed on a plate near to the entrance door, although I’m not sure if this is always true for the earlier caravans. Your best bet would be to contact your local caravan workshop and ask them nicely if they could advise. Sorry I can’t be of any further help to you. Re Tyre pressure you could always ring the manufacturer or an Avondale dealer ? Public remarks on YouTube state that the procedure shown is dangerous and in some jurisdictions illegal. As a newcomer to towing, I would welcome your remarks. I could be wrong, but I am sure it is a requirement now in the UK. I’m from England, Darlington to be exact; I would expect that you and AL-KO would be correct, but as I said, I’m a novice so I’d welcome your opinion on the comments. Thanks to your website I have identified the year of my caravan as 1989. NCC number is 89AB 256418 (exactly 80 prior to another correspondent), and the difficulty I’ve encountered highlights the staggering lack of reliable information available, especially on earlier vans. None of this is your fault, of course, but with owners’ manuals being non-existent, or nearly so, ABI being less than helpful on tourers, and the abifriends website dead, one looks to reliable independent sources, such as you and other industry professionals provide. If it helps, and I think it may, I will undertake to compile and maintain a pre-92 ABI register and knowledge repository. It will be far from an owners’ club, but will at least be a start. Hi there. You have compiled some very useful info. Hope you would like find space for some of this info too. Pre-flight check 2: Hi. The breakaway cable has long been a legal requirement. It’s purpose is of course to apply the caravan brakes, before possibly snapping, in the event of the car and caravan parting company. Pre-flight check 6: It is also a good idea to also check lights, brake lights and indicators all work when all in use together. This checks for poor earthing. Pre-flight check 9:It is essential that caravan wheels and tyres are correctly balanced. If you don’t balance the front wheels on cars, the steering wheel usually shakes like mad around the 50mph mark. Caravan wheels can’t shake your steering wheel, but they can shake their nuts or bolts loose, or shake the van to pieces. Something has to give somewhere! A lot of tyre fitters i have spoken to don’t what the red dots on the sidewalls of tyres are for.. To clarify, it should be aligned to the valve stem. This aids correct wheel balancing, and avoids excessive weights being used. This applies to both steel and alloy wheels. Also check “DOT” codes on the side wall of tyres to confirm the age or the tyres. eg: code 2416 denotes tyre manufactured in 24th week of year 2016. A tyre’s age starts from when it was made, NOT when it was fitted. Tyres of pressures exceeding 50 psi should be changed every 5 years, not 7. You don’t mention this, but another good idea is to check the nose weight of the van on the tow ball, and to check that on the flat, the front of van is slightly nose down when ready for the “off”.